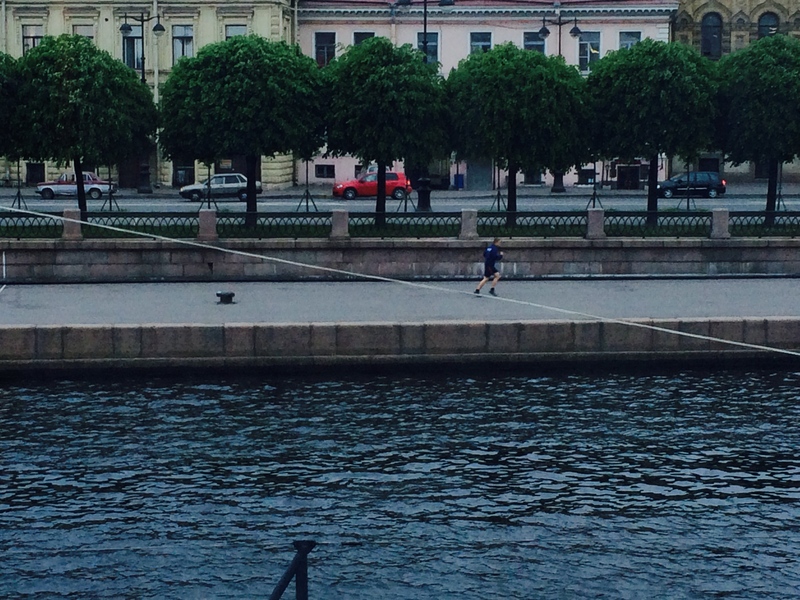 This post could just as easily be titled “No Running in Russia.” The beautiful city of St. Petersburg has more than enough sites to fill several days of travel. 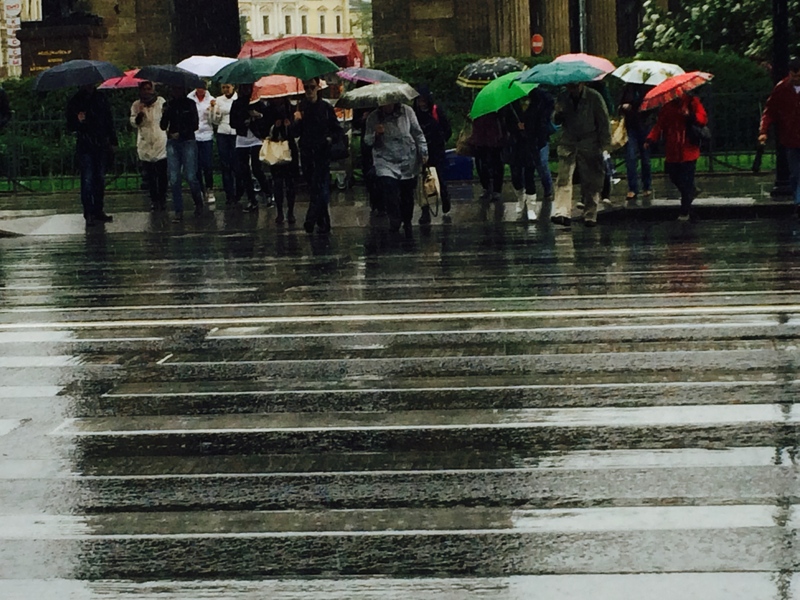 But, why not a run after a long day of sightseeing? The weather was mostly beautiful, the daylight extended to midnight, the street facing the ship’s dock offered a scenic running route . So, why didn’t I run? I learned prior to the trip that I would not need a visa for Russia if I was signed up with one of the travel companies located in St. Petersburg and was in their company during my time off the ship. To avoid the additional cost and time involved in preparing and submitting information for a visa, I opted to do a 3-day tour with a wonderful tour company, Alla. Disembarking the ship each day, we passed through Russian Customs, showed our passports and tour tickets for the day, then met our wonderful tour guides at their waiting van. Leaving our guide for the day, we returned through Russian Customs located near our ship’s gangplank. Midnight runner as white nights approach. What I couldn’t do on shipboard was what I longed to join this runner in doing – heading down the street for a run. Second guessing aside, the days in St. Petersburg were filled with the sights that are not to be missed by travelers to this amazing city. We had the good fortune to be there on its birthday (May 27, 1703) so the city was particularly busy and beautiful. The experience, both visually and historically, in a city of monuments to czars and the site of the Siege of Leningrad where an estimated million people died of starvation during World War II, is far too dense for a blog post. So, I touch on a few of the sights that stood out for me. 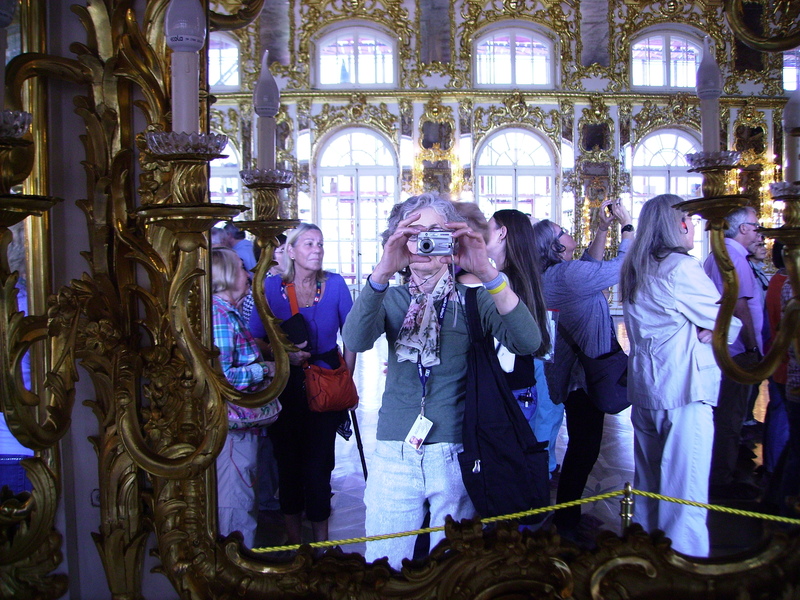 For a full list of what can be seen during 3 days in St. Petersburg, here is a link to the Alla 3-day tour description. 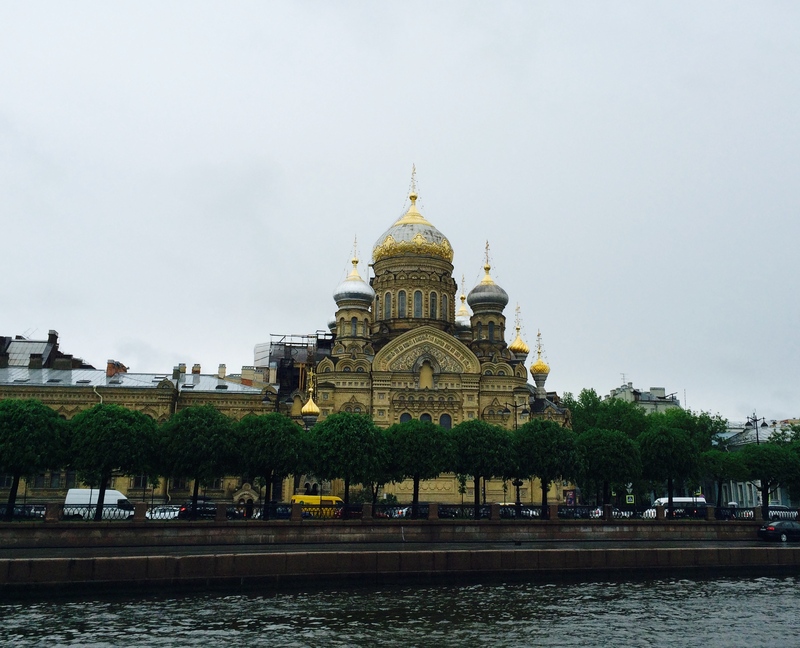 Where does every tourist visit in St. Petersburg? The Hermitage, of course. 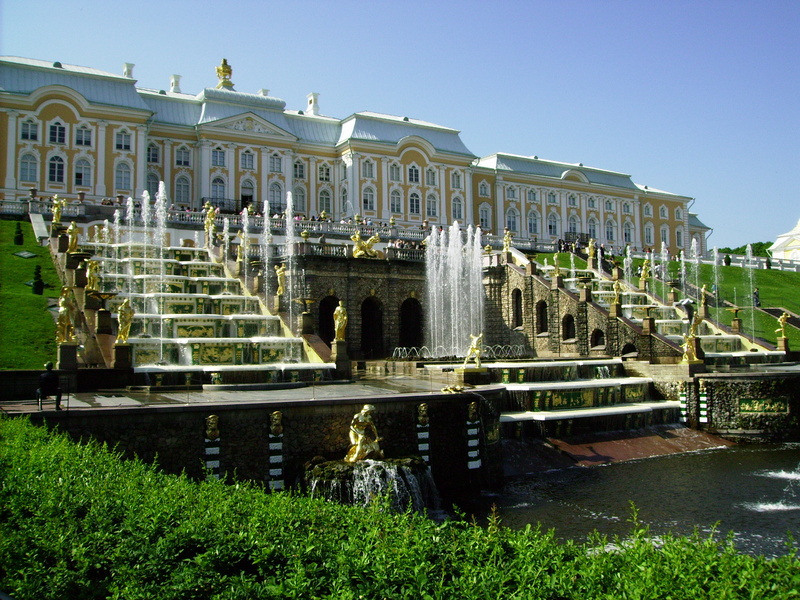 The expansive gardens at Peterhof with their weird and wonderful waterworks were immediately reminiscent of the gardens at Versailles. 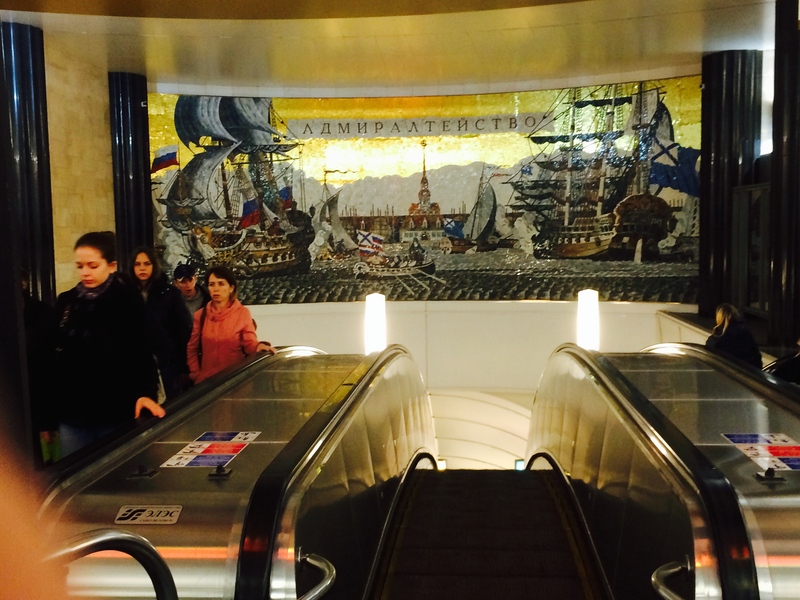 Deep underground in St. Petersburg, what is said to be one of the most beautiful subway systems in the world awaits. 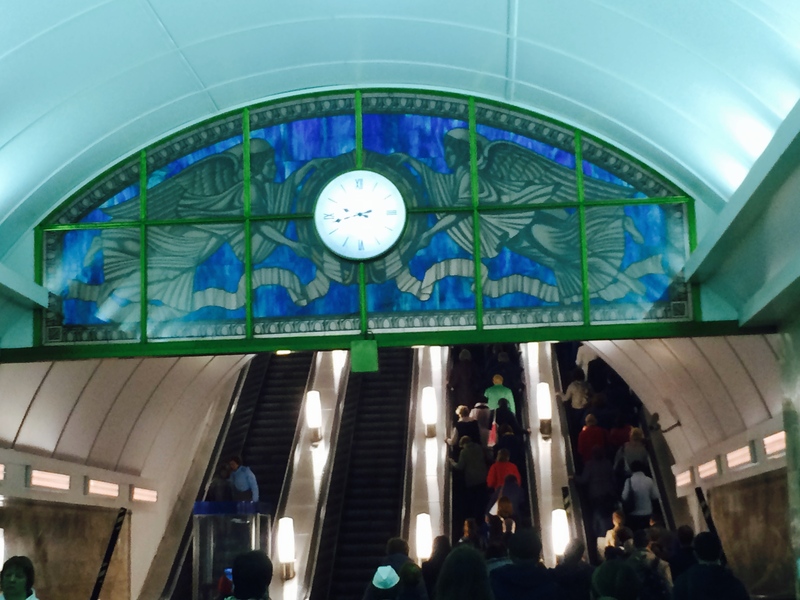 Stained glass can be found at every entrance and terminal. My personal favorite was the Russian Museum, far less crowded than the many palaces we visited which gave us an opportunity to appreciate and view the art without peaking through hordes of fellow tourists snapping photos .The aptly names Russian Museum houses the works of Russian artists from the 10th Century through today. I was particularly moved by the depth of color and emotion in the 12th century icons. The art on display depicts village life and work as well as that of the noble class through the centuries. Here you will be privileged to see works by artists you may not yet familiar with (as was the case with me), along with others such as Marc Shagall. My advice for visiting this beautiful city: Do your homework to understand its history, make sure the Russian Museum is on your itinerary, and if you want to run – get a visa. I agree with the whole “not-having-a-visa” nonsense. On our first day there I wanted to go out and explore, but, I couldn’t. Next time I go I will definitely get one and hopefully explore some more! The luck of the draw at Peterhof. Our boat tour was scheduled on the rainy day, still a great tour with lots of historical background even as we huddled in the cabin and under a tarp. I really want to visit St. Petersburg! So much interesting history. Let me know when and if it becomes firm. Lots more info I can pass on. My brother lived in St. Petersburg for 3 years in the early 90s. He still rambles on and on about its beauty–lovely to see your photos. I would love to pepper him with questions about life there, and what an exciting time the 90’s must have been with such major changes. 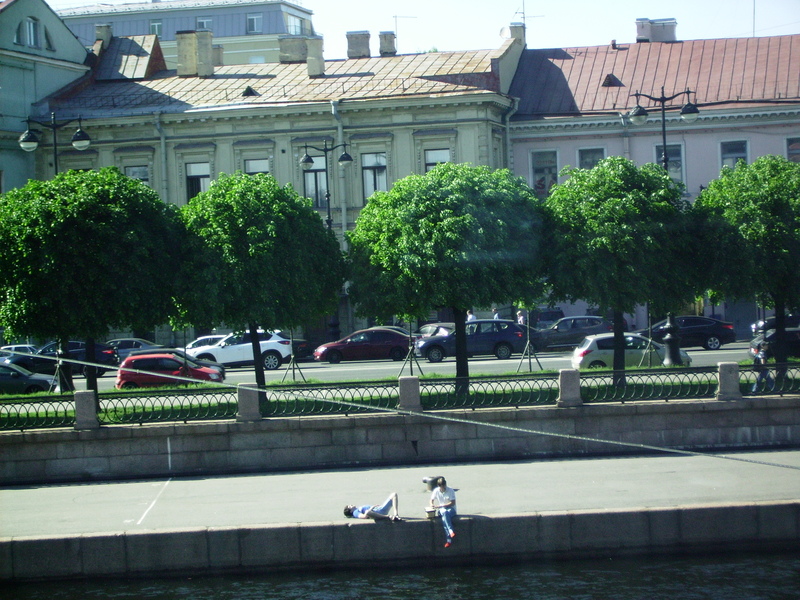 I was in St Petersburg for three weeks last year. Incredible city. 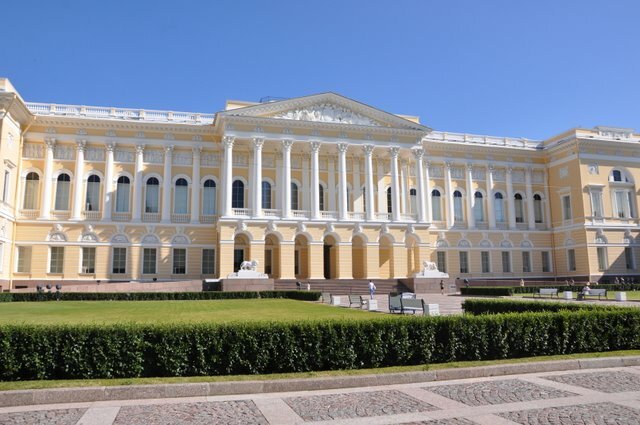 Like you, I also loved the Russian Museum, in fact preferred it over the Hermitage. I miss the loooonnnggg summer days. It was fantastic having it be close to midnight and it was just starting to get dark. I loved the long daylight as well. It was a rude shock to loose it so quickly when returning home.